Walkers and climbers heading for Wales’s highest peak had better make sure they have a packed lunch. Hot on the heels of the news of the Snowdon summit cafe’s winter closure comes news that the refreshment facilities at a busy starting point will also be out of action for the next few months. Hafod Eryri, the summit building that opened in July, was shut down earlier this month and the hatches have been battened down to protect the cafe, on the 1,085m (3,560ft) summit. Now, the cafe at Pen y Pass, one of the most popular starting places for ascents of the mountain via the Pyg Track and Crib Goch, has closed too. 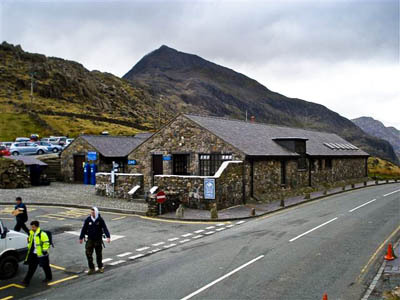 A spokeswoman for the national park said: “Snowdonia National Park Authority provides warden offices, toilets, a bus shelter and cafe facilities at Pen y Pass but due to the departure of the current tenant, there will be no cafe facilities available there until early next summer. The authority’s property manager Pete Trumper said: “Pen y Pass will see some major changes within the next five years. Our intention is to upgrade the facilities making it much more accessible to all users. “However, during the winter months some essential maintenance work will take place at the cafe, but this should not interfere with our usual services provided at this location. The national park is now inviting expressions of interest for the cafe tenancy. Closing date for these is 1 December, after which tenders will be invited. Its open and its awesome. Go there soon!